What Would You Have Seen In The British Isles Three Billion Years Ago? The British Isles are a geologically strange and beautiful place, with deep caves, volcanic islands, and the huge boulders of Stonehenge all sharing the same landscape. But just what would it have been like to see that singular topography unfold before your eyes? The British Isles have been more thoroughly mapped than any other part of the planet (there are some geological maps that are accurate to within a metre), and we have an enormously long history of mining and civil engineering that has given access to the rocks. But in part, the UK is very unusual in that it has quite so much geological history compressed into such a small area. That's because there is evidence multiple continental collisions inside the UK which has allowed very disparate rocks from very far distant places to be brought into close proximity. So if you start in NW Scotland you're walking across three billion year old gneisses which are tectonically similar to those of Labrador and Greenland, go just a short distance SE and you reach a gigantic thrust fault which has pushed enormous thicknesses of marine sediments over the gneiss to form the Highlands. Keep going South and you reach the Southern Uplands which are the boundary between two former continents once separated by an ocean - in a few kilometres the fossils change dramatically and you find slivers of former ocean floor, enormous piles of volcanics and the debris from underwater ocean slides. The Caledonian mountains stretch from the Appalacians to Norway and were probably as high as the Himalayas. Head into Wales and you find the Southern shore of that former ocean with preserved coral reefs and volcanic deposits from a tropical ocean piled up on top of an ancient continent called Avalonia which is almost entirely buried. That takes you to just about 420 million years ago. After that, Britain was lying close to the Equator, much of the South and Centre of the country was underwater so was covered with coral reefs. Gradually, the mountains of Scotland and Wales were eroded and buried the coral in river deltas covered in thick fern forests that decayed into massive coal deposits. Meanwhile Central Scotland was being stretched and faulted, it sank and was filled with marshes (more coal) and volcanoes (hello Arthur's Seat). At the same time in the South, a second massive continental collision pushed a chunk of ocean floor up over the rising landscape of Cornwall and filled it with some of the richest metal deposits on the planet. So for a while Britain had two massive mountain ranges. This part of history ends with the spread of a gigantic red desert across the whole of the country. We're now 280 million years from home. The desert intensified as Britain began to pull apart along new lines of weakness running roughly N-S which may be the first signs of the Atlantic rift. 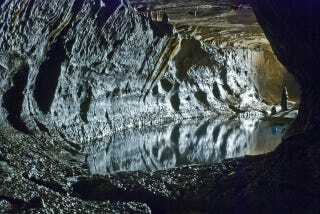 First a kilometre deep valley opened under what is now Birmingham, then the North Sea area began to subside into a shallow hyper saline sea which became filled with salts. On the West Coast another shallow pool of salt covered most of Cheshire. The Mesozoic in Britain is mostly quiet with landscapes being eroded and repeatedly subsiding and rising from the ocean, so there are huge thicknesses of shallow water limestones filled with fossils and thick clays. We also got some dinosaurs (yay!). By the end of the Cretaceous, Eastern Britain was subsiding rapidly into a deep sea which contained little in the way of nutrients so chalk piled up kilometre upon kilometre. We don't see the very end of the Cretaceous in Britain as it's been eroded entirely, but we do get Tertiary clays and shallow water deposits again mostly in Eastern England. However the Tertiary is AWESOME because it was when Britain was hit by a Mantle Plume (the same one currently driving Iceland's pyrotechnics). Following one of the lines of weakness from the Mesozoic the plume created incredible volumes of lava and intrusive igneous rocks across Western Scotland and Northern Ireland. It hit with such force that magma intrusions called dykes ripped their way across most of Northern England. There were volcanoes equal to anything on Earth right now - and it went on for millions of years as Greenland and Canada were pulled away by the spreading Atlantic. About the same time, the South of England was being bullied by the rising Alps, so all the lovely folds and faults around the Dorset coast and the Weald are the result of events a thousand kilometres further south. After that, it's pretty dull in Britain, more clays, more sands and a nice few glacials to reshape the landscape, but nothing terribly exciting. This is of course, horribly simplified.